The church: Bunhill Fields Meeting House, London EC1. Denomination: Religious Society of Friends (Quakers) in Britain. The building: Today the meeting house is the converted caretaker's house of a much large Quaker building that once stood here, bombed in World War II and not rebuilt. So the meeting house is domestic in scale and appearance, a small brick building of the 1890s. The church: The meeting house occupies an attractive little green oasis. Now surrounded  and rather hidden away from view  the meeting house can be accessed via the arched entrance to flats in Banner Street (look for the helpful signpost) or off the east end of Chequer Street, nowadays a pedestrianised walkway. The neighbourhood: This area is steeped in the history of religious non-conformism. Just a few yards away is Bunhill Fields Burial Ground, which was the main burial ground for Friends (Quakers) in the London area from 1661 area until 1851. George Fox (1624-1691), the founder of the Religious Society of Friends, is among those buried there, along with thousands of other Quakers and religious dissenters including the poet William Blake, Robinson Crusoe author Daniel Defoe, Pilgrim's Progress author John Bunyan, and Thomas Bayes, who is regarded by many as the founder of modern statistics. 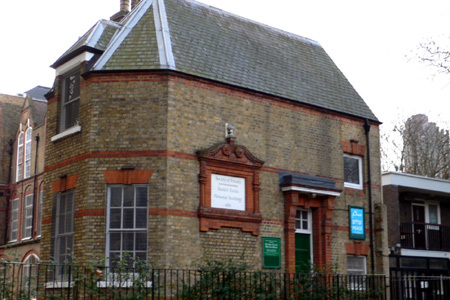 A two minute walk away are John Wesley's London chapel and his manse, now a museum. The corporate wealth of the City of London is a short walk away from here but the immediate surroundings are those of the inner city: social housing, offices deserted at weekends, a couple of large supermarkets. The cast: One of the distinguishing features of a Friends' Meetings is the lack of visible leadership. The date & time: Sunday, 27 November 2011, 11.00am. With 15 attending, almost at capacity, as the room is small. Eight men, seven women, all ages from 20s to 70s. The door was invitingly ajar when I climbed the few steps. As I entered a lady welcomed me, immediately spotting me as a newcomer. She asked if I had been to a Quaker meeting before, and as I hadn't, offered a leaflet about what to expect when attending your first meeting. A circle of chairs and a couple of benches with cushions were set out around the edge of the room. Mine, a chair, was very comfortable. Most people sat quietly. A young man nearby must also have been at his first Friends meeting as he was responding to an explanation of what would happen, saying that it was exactly what he had discovered he was looking for. Those sitting either side shook my hand as I sat down and introduced themselves, first name terms. There were none, we all fell silent at 11 o'clock. I was not aware of a signal and if there was one it, too, was made in silence. In the middle of the room was a small table with a potted cyclamen on it and four books with red covers. I saw later that one was The Holy Bible (King James version, I think) and one of the others was Advices and Queries, a Quaker devotional handbook. I didn't get to identify the other two volumes. There were no service sheets or any other written paraphernalia. Midway through the meeting I realised with a start that I hadn't switched my mobile phone to silent. I discreetly flipped it off. Happily nobody had rung me, or its chirpy ringtone would have instantly reminded the whole room of the urgencies and demands of daily life  surely just what were seeking escape from. This was the quietest religious event I have attended. A gusty wind rustled leaves outside from time to time. Someone cleared their throat. A faint hum from the heating and a distant child's shout made up a wonderful presence of communal silence for almost all the hour. As is usual in Quaker meetings there was none. Two people in the circle were moved to give testimony, speaking without announcement into the silence. For one elderly lady the previous week had been a wake-up call for her in realising how many talents were wasted, her own and others. She sketched the parable of the talents: "I don't mean money and such, but what people have to offer." Some time later a gentleman read a brief extract from Advices and Queries. "Live life adventurously", it started and continued in a similar vein to the earlier testimony about realising oneself and others through a life inspired by God. These two brief interventions were all that broke the silence. The silence. I find communal silence deeply moving and powerful in ways I cannot adequately explain. At meditation classes or in a eucharist where a long post-communion silence is kept, I find the same. But this was the best. The fleeting moment of panic that my phone might break the atmosphere. No chance. Everyone shook hands with the person next to them and there were a few administrative notices. Then the young man who was also a newcomer was introduced to the room as coming from the Occupy London tented encampment outside St Paul's Cathedral. In reply to this he thanked the meeting for its support, so I suppose some of those present must have visited the camp, perhaps given money or food. Whether by accident or design this seemed to fit perfectly with the testimony in the meeting, the human cost of high unemployment, the lack of opportunity for fulfillment, at least through work, that so many now face. Tea, coffee and biscuits were brought round. Tea in a mug with a picture of Memorial Buildings on it. This was the Quaker settlement that had stood on the site until the Blitz of 1940. The former caretaker's house in which we sat was just visible. The convivial chat looked set to continue after I left 40 minutes later. 9  This was spiritual minimalism, and very different from the soup-to-nuts liturgy I am used to on Sundays. But I loved every minute of it and am considering going regularly in between visits elsewhere. The power of collective silence.